I am a #Catholic #Folk #SingerSongwriter inspired by Jesus' Teaching in the Gospel of Matthew 10:42 to give "a cup of cold water" to the least of the brethren for the brethren's sake. Following this Teaching, I have composed an Album: A Cup of Cold Water to give away for free to anyone who wants to hear it. As a part of this mission I have joined Top Catholic Songs to make my music available to anyone who wants to listen by Embedding my Album in this Story. Another Site to Visit which is my "Official" Home Page for everything "MTR" is Resch.com . There are several features about this Embedded Digital Album you should know about. First, it is connected through the Internet to my site on Bandcamp. It accesses the AIFF Sound Files I Uploaded to the Bandcamp site. They are Apple 24 bit PCM signed 48 kHz Sampling rate, 2304 kbits/sec Bit Rate Sound Files. There are no sound files stored on this site. The Sound Files that you are listening to through the Embedded Album are converted from the AIFF Files to MP3 16 bit, Sampling Rate: 44.1 kHz, Bit Rate: 128 kbits/sec Sound Files. You can Play the entire Album by clicking on the triangular "Play" symbol in White on the Album Cover. Alternatively, you can click on any of the 13 Tracks to jump to any one directly. If you want to go to my Bandcamp site, just click on the blue colored Album Title. Another thing you can do is click the blue colored Download. That also takes you to my Bandcamp site where you can Download the Entire Album in whatever sound file format you prefer; like WAV, MP3, FLAC or AIIF to name but a few. However, if you want to import the Album Files into iTunes, you must download in either AIFF, or MP3 because iTunes is designed to only be able to insert .jpg Album Art into AIFF or MP3. WAV, FLAC and MP3 Files import into Microsoft's Groove and Media Player. Therefore, if you want to use iTunes and have Album Art on your Album you should choose AIFF or MP3 for Sound Files Downloaded from my Bandcamp site. Which File Format should you choose? It all depends on how you are going to use them. For a Portable Player, with Limited Memory, choose the MP3 Format, they take less Memory. An Album with MP3 16 bit, 44.1 kHz Sampling rate and a Bit Rate of 320 kbits/sec has a Total Memory size of around 100 MBytes. An Album using AIFF Apple 24 bit PCM signed. Sampling Rate: 48kHz, Bit Rate: 2304 kbits/sec Sound Files has a size of 709 MBytes, has a wider Frequency Spectrum (more Octaves of sound information) than MP3s, has more Digital Information and Sounds Better than CD quality in the iTunes Player. You also receive two PDFs: one of my Biography and another of the Info & Lyrics of the Album. It is a 709 MB Download, which takes about 5 to 7 minutes if you have an Internet Provider which has 15 Mbits/sec Download speed. The Files come in a ZIP Format, so you must have an app like WinRAR to unzip the package and insert them into a Folder that you can then Import into iTunes. WinRAR is an Excellent app that you can Download for free and Try out for 30 days before paying a Lifetime license fee of around $30. Google WinRAR to find the Download site and details on how the app functions. I Highly Recommend exporting them into a new Folder because it's easier to import a Folder than importing the Files one by one. Once inside iTunes Select File, and the select Add Folder to Library, navigate to the Folder you just extracted the Contents of the ZIP file into and Select the Folder and then Select OK. Then the Album will be automatically imported into iTunes. Select Albums and Right-Click on the Album Cover of A Cup of Cold Water and Select Get Info. The first thing you have to add is Composer, insert Yahweh into the box and select Show in all Views and then go to Track and add the number 13 to the second box. Then Select Options and Select the box that says Remember Playback Position, Then go to Equalizer and Select Flat. That way you will be listening to the Frequency Spectrum that has been Engineered into each Audio File exactly the way I hear them in my Sound File Editing app Goldwave. You're Finished here, finally Select OK at the bottom of the Dialogue box. That will insert all of the changes you have made into all 13 Tracks. Next Select Songs and Right-click on each Track and select Get Info to edit the Track information. Then you must add the Genre of the Song to each Track. This is a limitation due in part to incompatibilities between Bandcamp's Tagging Method for Genre and iTune's Tagging Method for Genre. I have them listed here for your convenience. Oh, two other things: on Track 07 change the Composer to Anonymous, and on Track 11 change the Composer to Paul Desmond, as shown below. All of the other 11 Tracks will already show Yahweh as the Composer. Click OK and you're Done, the Album is all Set-up for you to Listen to. If you want to view the Lyrics to a Vocal Track, select Songs and Right-click on each song which has Lyrics and select Get Info again and Select Lyrics and they're already there for you to view while the Song is Playing. There is almost twenty times more information coming into your ears with the Downloaded AIFF Files vs. the MP3 Files you Listen to on the Embedded Album. That gives the Vocals much more Clarity and Presence. It lets you hear the Ring in Jake (my Banjo) in Baptism Song and River of Life. It lets you hear St. Camillus' True Voice (My Martin D-28S) in Meditation II. It lets you hear Gen Randall's keys clicking on her Flute and her Breath Sounds on Take Five. You can Download for Free by entering $0 dollars for the cost. Bandcamp supplies me with 200 free Downloads a month for my Fans and Followers. Alternatively you can enter a dollar amount for the Download, of which about 75% goes to support my Music Ministry expenses. A suggested amount is $1 per Track. That is a standard price for other Music Download sites. Alternatively, you can Download for Free and Support my Music Ministry by buying an MTR Self Portrait T-shirt. On an XXL T which goes for $13 plus $4 shipping and some Sales Tax (if you have Sales Tax in your State) I get approximately $3.43 for my Ministry Account. Listen carefully to the message in River of Life where it says: . . . when you see that the Choice that you've Made with your Living, is the Answer you Take to His Heart which is Love . . . If you've never Downloaded a Digital Album before, I suggest that you use Google to get the sound player iTunes for your operating system, be it Windows or Mac OS. It is a full featured, free piece of software that I highly recommend. I suggest that you get it installed on your computer before you Download the Album. P.S. - for your convenience I have included an attachment to this Story which is a PDF I created of the Info & Lyrics to each Track. Just Right-click on it and choose "open in a new tab" while the Music is Playing in the Embedded Album and you can read the Info & Lyrics as the Tracks Play. I like your "care-free" mug shot. And knowing that you added those two songs to the original 11, I will send them to Mark K. and Sister J.A. at fscc-calledtobe.org. I had sent the original 11 to them yesterday. P.S. - If you insert the Bitlink in a Tweet, or insert it in an Email with HTML capabilities, you can take it easy on yourself by not troubling to send files. MTR, I sent you an email regarding my modus operandi with FSCC. I sent them links to your Twitter account two days before sending them MP3 files. The MP3s are for their convenience if they wish to post 1 or 2 songs in a feature article. They will need properly "tagged" MP3 files with artist, song title and album title. Chords for any of the songs in ACOCW? MTR, do you have lead sheets with guitar chords for any of the songs from this album? I'd like to try out some with my no-name guitar. Followup: Have people ever asked for your songs as lead sheets or as a complete scores with guitar chord names and piano arrangement? The reason I ask is because I have resources to help you prepare either. It sometimes helps to have sheet music to supplement and enhance distribution/sales. 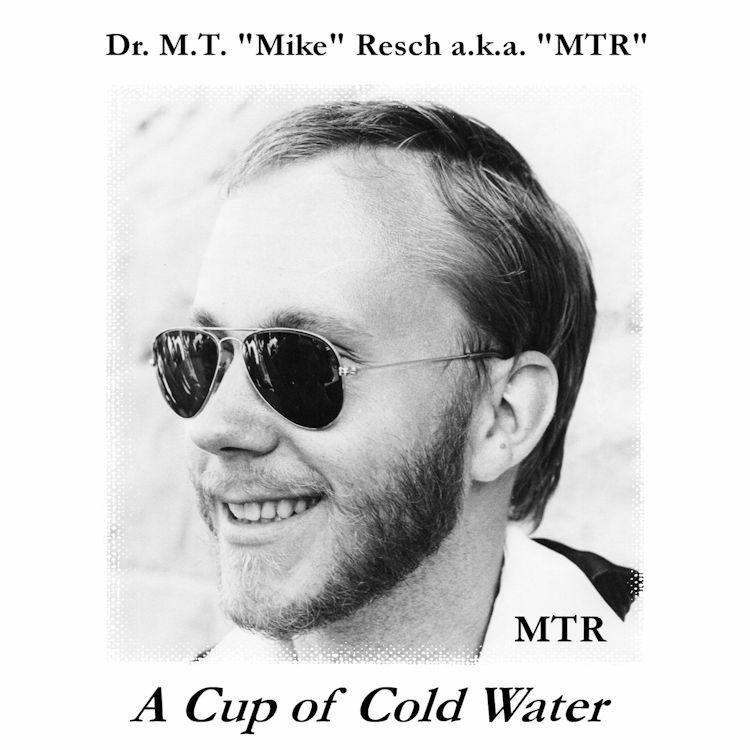 Update of the Info & Lyrics to "A Cup of Cold Water"
Thanks for the update, MTR. I hope your album gets a lot of earplay and sales. All for Jesus.